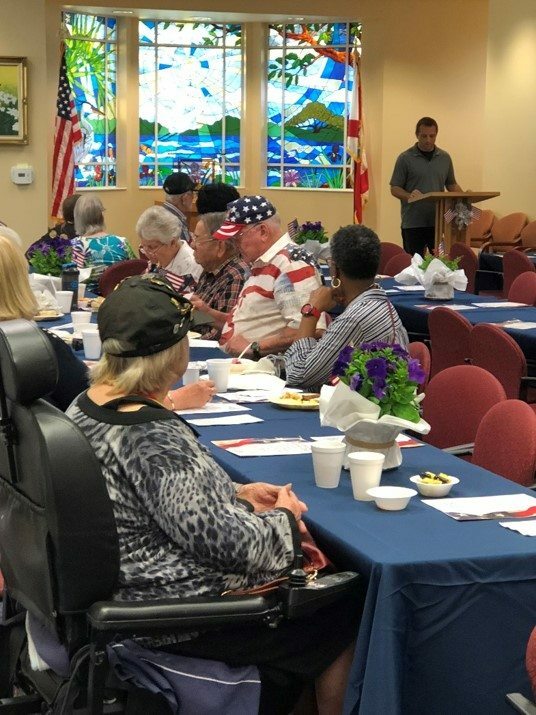 Veterans from the Suwannee Valley were celebrated at the Haven Suwannee Valley Hospice Care Center during a Veterans Appreciation Day event on Friday, November 3. The celebration included brunch and presentations by fellow veterans Jennie Lyons and Ian Gray. Haven also welcomed attendees from the Robert H. Jenkins Jr. Veterans Domiciliary Home of Florida. Many thanks to the volunteers and community members who made this year’s event such a success. Every day, Haven recognizes and appreciates our veterans of the United States Armed Forces and honors their service by customizing care to meet their unique physical, spiritual and emotional needs. In 2016, Haven cared for more than 854 veterans across North Florida. Ian Gray speaks to Chiefland veterans on November 3 at the Haven Veterans Appreciation Day in Lake City.